Darkterror, the Faceless Void, is an agility hero that can be played either as a carry or as an offlaner. Blessed with powers that help him manipulate both time and space, Darkterror’s abilities allow him to instantly mend his wounds, jump short distances, freeze ability cooldowns, and prevent entire teams from moving or acting in any capacity. His first ability Time Walk allows him to weave in and out of combat, acting much like Magnus’ Skewer or Slark’s Pounce—but without affecting enemy units. In addition, Time Walk instantly reverts all damage dealt to Faceless Void within the last two seconds, making him surprisingly durable and difficult to take down at almost any stage in the game. Time Walk is actually what allows him to be such an effective offlaner, as he can simply heal himself back up after taking harassment damage. His second ability Time Dilation is very unique as far as active skills go. It is the only ability in the game that causes other abilities to stop their cooldown timers completely, thus acting as a “soft” silence of sorts. For each cooldown that Faceless Void is able to freeze, the affected heroes are slowed by 14 percent. Against teams that rely on rapid-fire spellcasting, Time Dilation can be very devastating—though it does require patience and control to use properly. His sole passive Time Lock is, for all intents and purposes, a simple bash ability. Faceless Void has a chance to stun an enemy unit with his regular attack, dealing bonus damage in the process. Whenever the bash triggers, Darkterror attacks the stunned target a second time in quick succession, much like how Echo Sabre’s Echo Strike ability works. Time Lock is an essential part of Faceless Void’s carry potential, which means that attack speed is an important attribute to increase when playing him. Finally, there is his signature ability and his ultimate Chronosphere, one of the most iconic abilities in all of Dota 2. With his cosmic powers, Darkterror rips open a blister in space and time, completely disabling all units (including friendlies) in its radius other than Faceless Void himself. Darkterror moves extremely quickly within the sphere—at a speed of 1000 units per second, to be precise. Chronosphere is a very powerful teamfight ability, though its lack of discrimination between friend and foe means that it must be used with a high degree of caution. Its potential for catastrophe is too great for it to be used recklessly, and so a degree of finesse and game sense is required to make the most out of it. But as with pretty much any carry, Faceless Void’s reliance on items is his primary weakness. Without a farm accelerant like Mask of Madness, Darkterror’s natural farming pace isn’t the fastest in the game, which means that he can get left behind by carries with cleave mechanics and other similar tools. It is for this reason that he is typically played in the offlane, with the end goal of being an initiator more than a hard carry. 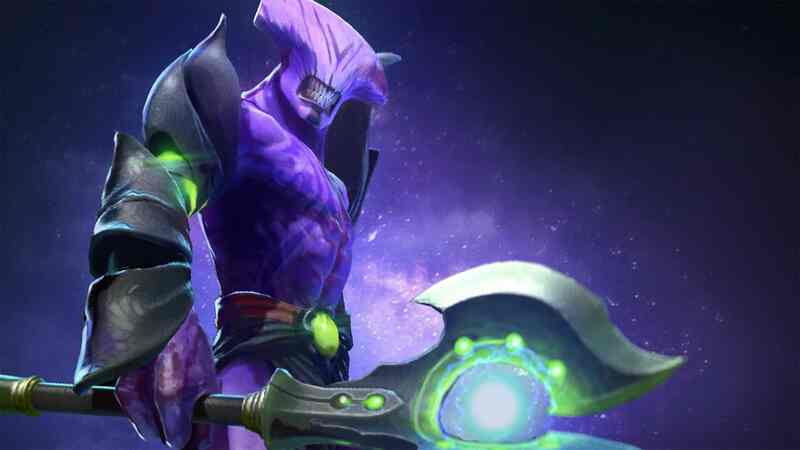 Though Faceless Void has the luxury of being able to choose between two roles, his ability progression is fortunately very simple. Both Time Walk and Time Lock should be maxed out first side by side, with Time Dilation left alone until the mid game. Time Walk should be where your first skill point goes, as it is your only escape mechanism. Its healing mechanic also allows you to survive the laning phase without having to spend too much gold on extra restoratives, which is very important if you choose to take the offlane. Time Lock is there to help farm, since it deals bonus damage to units that get stunned. Of course, it isn’t exactly reliable, but it does help a lot when luck is on your side. If you are able to secure a Mask of Madness, you can farm the jungle quite efficiently with just that and Time Lock procs. And of course, during early game ganks the bashes are always appreciated. Time Dilation is given the least priority, primarily due to its poor utility in the early game when heroes typically don’t have the mana to be casting their spells in quick succession anyway. It is much more useful later on, when freezing cooldowns has a much larger impact. Leave it alone until Level 11. Chronosphere, of course, should be taken at every opportunity. It is, after all, one of the most impactful initiation abilities in the game, and getting it to max effectiveness is key. Darkterror’s usual bag of items consists of attack speed gear and protective pieces. The attack speed gear is there to maximize his damage output in conjunction with Time Lock, while the protective items are there to make sure that he can whack away at targets trapped in Chronosphere unimpeded. Mask of Madness is one of the best early game choices for Darkterror, thanks to its cost-effectiveness. Lifesteal and a large increase in attack speed can be very useful in the laning phase, particularly in terms of farming more expensive core items. It can also be used for early gank opportunities with Chronosphere, which you should definitely be looking for if you’re in the offlane position. Once Mask of Madness is done, you may want to opt for a Shadow Blade or a Blink Dagger, if more mobility for easier initiations is needed. Shadow Blade can later be upgraded to a Silver Edge in order to counter certain passive abilities, while Blink Dagger provides instant initiation from many different angles. Remember that Chronosphere still has a limited radius, and sometimes it just isn’t viable to try to get all five enemy heroes inside. This is where Black King Bar comes into play. Should you be unable to trap heroes with long disables using Chronosphere, Black King Bar is the only way to keep yourself from getting stopped cold in your tracks. After all, the enemy team wants to prevent you from eliminating a key hero during Chronosphere, so you can definitely expect them to pour disables and nukes onto you once your ultimate is out. BKB allows you to keep going in spite of any disables that might come your way, so be sure to buy it no matter what position you’re playing. From there, your item build opens up significantly in terms of the possible avenues. Diffusal Blade gives you a useful slow and some really annoying mana break capabilities. Sange and Yasha is perfect for pushing your team’s mid game advantage, thanks to its aggressive nature. Linken’s Sphere can be purchased in lieu of Black King Bar in certain situations, though it usually isn’t ideal given how much of a disable magnet Darkterror is during Chronosphere. For late game choices, you can opt for a Manta Style against silence effects, or even a Nullifier if you want to mess with enemy BKB wielders. Butterfly is another excellent option, particularly when facing enemy carries. Darkterror’s combo is simple, but doing it correctly is more difficult than meets the eye. Depending on your itemization, you may have to initiate with Time Walk rather than Shadow Blade or Blink Dagger, so make sure to take this into account when planning your engagements. After all, Time Walk has a much shorter range than Blink Dagger (at least, before the Level 20 Talent), which means that it is more predictable—especially if the enemy team’s vision game is on point. Shadow Blade allows you to initiate under the cover of invisibility, but as always it is countered by Sentry Wards and Gem of True Sight. Regardless of how you’ll be initiating, though, you’ll want to cast Chronosphere as soon as you get to your landing spot. If you delay your ultimate, chances are you’re going to get silenced or disabled before you can get it off, so make sure you’re in the right position and that you’re ready to commit to the fight. Once that’s done, pop Mask of Madness and BKB, then whack away at the softest target in Chronosphere. With any luck, that hero will be long gone before Chronosphere expires, giving you and your team a significant numbers advantage for the rest of the engagement. Here’s where it gets a bit tricky, though. By the end of the first few seconds of the teamfight, you will still have Time Dilation off cooldown. You will want to wait for your opponents to use a few of their spells before letting it rip; otherwise it won’t do anything at all. It has a pretty generous radius of 725 units, so getting as many heroes in it as possible shouldn’t be too hard. Countering Void is usually best done through silence effects and heavy disables. The fact that he relies on Time Walk to escape ganks and initiate when he has no mobility items means that he is especially vulnerable when he isn’t able to get any spells off in the first place. Silencer can stop him from initiating with Chronosphere altogether after he jumps in, and prevents his teammates from helping out in case he does get the initiation off. Orchid Malevolence carriers like Storm Spirit, and Queen of Pain can shut him down before he even has the chance to get away, and can make for very easy kills. Displacement mechanics are also good against Darkterror, especially if they can remove him or his targets from Chronosphere. Pudge’s Meat Hook can help save one hero from Chronosphere, or bring a near-defenseless Faceless Void into your loving arms. Keeper of the Light’s Blinding Light causes knockback, and causes a lot of Void’s attacks to miss completely. On the flipside, heroes with protective abilities such as Omniknight with his Purification and Guardian Angel can nullify Chronosphere’s effectiveness. Of course, this doesn’t mean much if those heroes are the ones that get caught in Chronosphere in the first place, so playing safe against Darkterror is still key.